Neck pain and headaches are often a sign of misalignment of the cervical spine. Your cervical spine is comprised of the vertebrae in your neck. You have seven neck bones and they are numbered C1-C7 starting with the first vertebrae under the skull. These vertebrae balance your skull, allow your head to move in many different directions and most importantly protect your brain stem and spinal cord. At each vertebral opening, spinal nerves connect your brain to facial muscles, hands, arms, fingers, neck muscles, thyroid gland, sinuses, tonsils, eyes and many other parts of your body. Misalignment of these vertebrae can result in compressing or pinching of these vital pathways. This oftentimes is the most common cause of neck pain and headaches. These misalignments, or subluxations, continue to progress and degenerate the cervical spine resulting in disc damage and osteoarthritis. The longer the condition exists, the more it degenerates, prolonging the long-lasting effects of blockage of nerve flow to these spinal nerves. An example of this would be numbing and tingling in the hands and fingers. These nerves originate in the C4-C7 vertebrae. If the proper “flow or current” has been blocked, the common symptoms are numbing, tingling and weakness in the hands or fingers. Just like the unkinking of a water hose, correction of these misalignments allow proper flow or current to the affected areas. 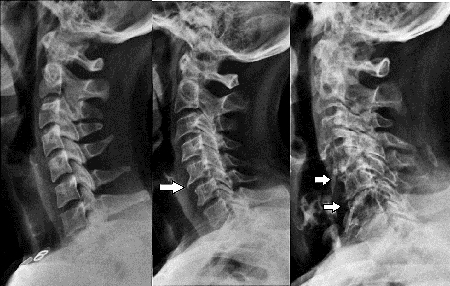 The first picture shows a neck with healthy vertebrae, the second figure shows a neck which has had prolonged misalignment leading to bone spurring and the third shows degeneration due to lack of correction over time. Surprisingly, the patient in the third figure had tremendous improvement in neck pain, headaches and numbing of hands and fingers after only one month of care! These cervical misalignments can constrict flow of vital nerves leading to the brain and brain stem, causing headaches. Millions of dollars are spent yearly for over the counter and prescription drugs which may provide temporary relief from headaches but do not prevent reoccurrence and, more importantly, do not correct these misalignments which contribute greatly to the cause of most headaches and migraines. Rather than temporary symptom relief, our focus is restoring proper alignment resulting in natural symptom relief and prevention of future deterioration. Chiropractic Biophysics ® is designed to analyze these misalignments with the help of specific X-Rays to determine the best approach at correcting these subluxations. A Better Life Chiropractic offers Chiropractic, Massage Therapy, Exercises and educates patients on proper sleeping positioning to prevent further damage to the cervical spine. Call (239) 263-3369 for an appointment today. Tell Tale Contributor: Have you seen these people?